*HOT* $1/1 Honey Bunches of Oats printable coupon! You will want to grab this printable coupon before it’s gone! Head over to Coupons.com now to get your $1/1 Honey Bunches of Oats printable coupon! Even though the coupon has the Walmart logo on it, it’s not a Walmart coupon and you can use it anywhere that accepts coupons. I don’t know about you, but I’ve been really low on cereal coupons. It seems like there aren’t too many available right now. I was so excited to see this offer. 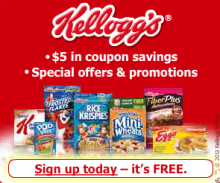 You can sign up to recieve $5 in coupons, special offers, promotions & more from Kellogg’s! That means new cereal coupons! Final price: $0.25 a box after coupon and RR’s! Coupons Jan 10, 2011 in cereal, drugstores · Expired! Ever since we had a baby, Cheerios have been a huge part of our family. Even our dog is eating Cheerios on a regular basis! It’s great to get five weekly tips along with $5 in coupons from Cheerios. I just got mine! Try a sample of Kashi Go Lean or Kashi TLC bars now through February 12th or while supplies last. Visit Kashi’s free sample page and select one of three choices. I’ve always been courious about the TLC bar, that’s my pick! Offers Jan 25, 2010 in cereal, free · Expired! I like plain cereal. So the new Chocolate Cheerios may not be for me. But I would love to hear what you think! Here is a coupon for .50 off one box of the new Cheerios.